The AT Strain Relief Series’ specifically designed wire cavities protect each individual wire seal, eliminating stress on the rear seal, maintaining IP67 sealing performance regardless of wire bundle direction or improper installation. It is a cost-effective and highly-reliable solution for wire routing, strain relief and sealing issues common in Heavy Duty applications. It ensures a complete environmental seal and necessary strain relief on the production line and in the field. A wide range of standard color options are available for all A Series™ product lines. 8 and 12 position plugs and receptacles require special order. For more information, please contact a Sales Representative. These modifications are a sampling of the options available. For more options, please contact your Sales Representative. AT Series™ connectors offer several modifications for increased design flexibility or special application requirements. AT Series™ J-1939/11, 3-Pin connectors offer a high performance, reliable and cost effective solution for the SAE 3 position CAN Network requirements . 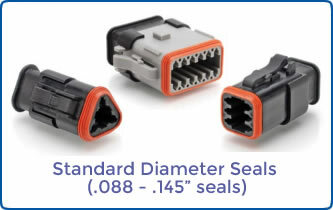 This series is designed to be completely compatible with existing industry standard J1939/11 connectors and provides a complete line of connectors including Y receptacles, network terminations with 120 ohm resistors, and keyed wedgelocks to prevent mis-mating. 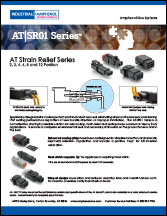 Additionally, the AT Series offers the –SR01 Strain Relief series in both 3 way receptacles and plugs for critical J1939 in-line connections requiring increased environmental protection and strain relief. AT Series™ connectors offer several flange mount options to increase design flexibility and simplify wire routing. Consult a Sales Representative for flange mount configurations and styles. NOTE: These modifications are only a sampling of the options available to our customers. For more options, please contact your Sales Representative.